On Monday, Aug. 28th, Hurricane Harvey was still making its third landfall and destruction along Texas with 50" of flooding in many places along inside the Houston city limits. That morning Justin Gaffrey and Amanda Kaiser met and asked what can we do to help with this relief effort that will soon be helping our friends in Louisiana and Texas get back on their feet. Amanda spent many hours online researching and spoke to over a dozen organizations on the phone in Louisiana. She finally came across the Cajun Navy who were very organized with staging areas and already had a listing of what supplies that were going to accept and not going to accept since it was the beginnings of relief efforts and in many places could not get into the affected areas. We felt we want to help, but be very cautious about not going into Texas without permission or escorts from the Cajun Navy and officials from local government personnel. That is why Amanda spent many hours diligently talking to organizations and finding where we could best help and involve the South Walton community to help also. "Hurricane Harvey laid heavy on my heart, for I felt like I have acquired many friendships through our clients from Houston," explains Amanda Kaiser, Art Director of the Justin Gaffrey Gallery. "I watched the devastation taking place with all the flooding, and I did not want to feel helpless. Instead, I wanted to put our resources together to help the people of Texas as soon as we can." That afternoon, Justin made a sign with a list of donations to accept of essentials for the Cajun Navy to be able to get to the Texas shelters once able to the enter shelters safely. These supplies would help with their immediate needs for the stores all around were flooded and unable to open their doors. These donations were part of the first wave of relief for Hurricane Harvey victims. Once there was a game plan, social media postings circulated that included all the necessary details of which donations we are accepting for the Cajun Navy and which ones we would not be taking for the first wave of the relief effort. 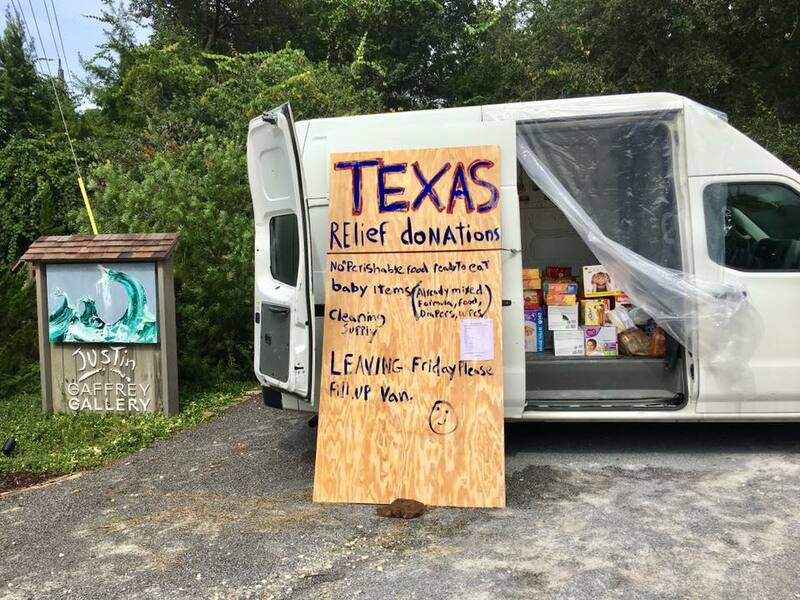 Justin left the van door open with a sign and instructions to leave donations in the van, that would be locked up at night. Well, it was not long until Justin, and his staff shortly realized they were going to need a trailer because the van could not hold the out pour of donations from the community. "We were to rendezvous with the Cajun Navy at the St. Charles Convention Center. The Cajun Navy directed us to a shelter in need in Western Louisiana to distribute supplies. The following morning we went to the disaster relief center organized by the Church of the King in St. Charles who were working in coordination with the Cajun Navy. We dropped the rest of our donations and reloaded our four trucks and trailers with relief supplies and stopped at the Delta Downs Casino where they added more donated supplies to go to Nederland, Texas. We observed that the supplies went to people in immediate need picking up before they had a chance to hit the table. Everyone in Louisiana and Texas gives thanks to all of you who helped." Since Justin's return from Texas, he has been working and completed a new piece very close to his heart named, "Help." This piece below depicts of all the different kinds of people in humanity that came together to "Help" Texas without any questions of their differences. This painting is so dear to his heart because it felt like everyone had put away their political differences for a common goal, to "Help" their human kind with open arms. For anyone one who wants to continue to help, please connect with this link www.churchoftheking.us. This group is coordinated with the Cajun Navy, and they are running a highly coordinated organized effort to help in disaster relief. The Cajun Navy will be running a recovery effort now by assisting people to get their homes in order, and they will need items from cleaning supplies to sheet rock as well as volunteers to help. As the summer season on the beaches of South Walton is winding down, we reflect on what has been a great year thus far for the Justin Gaffrey Gallery. Justin started the year with introducing his new Collector’s Series line of works that are One-of-a-Kind originals that will never be repeated or commissioned. These elements are essential for all collectors of Justin’s work for the value of his pieces increase with a special series like this as a new body of work. 2017 has also been a record-breaking year for commission orders. We want to thank everyone for the continuous support for Justin’s work as he diligently completes all commissioned art work. We are all elated with the success of Justin’s Wave Series of paintings. This year Justin has extended the Waves into captivating the shoreline and added characters from his conceptional self-portraits to tell the personal story of these pieces. Justin also branched out with Seascape Series by painting different seashore locations. These areas included Shi Shi Beach in Washington State Park where he camped off the grid on the shoreline of the Pacific Coast. He also included the Crooked Island Florida grouping that represents the barrier islands just South of the Tyndall Air Force Base outside of Panama City Beach, FL. Follow the Justin Gaffrey Gallery on Facebook, Instagram and Snap Chat to view the continuous story of the prolific chef, turned artist and makes beautiful expressions for to savor!